Within an hour of my arrival at summer camp in North Carolina’s Blue Ridge Mountains the summer I was ten, I was hunched up in a puddle of tears. A group of returning campers had introduced me to Camp Mount Mitchell’s initiation ritual—they knocked me to the ground, pulled off my sneakers, and tossed them onto our cabin roof. Those sneakers may as well have been on the moon. I was so frightened of heights, the thought of having to climb up to that roof left me inconsolable and weeping. That fear of heights stayed with me. 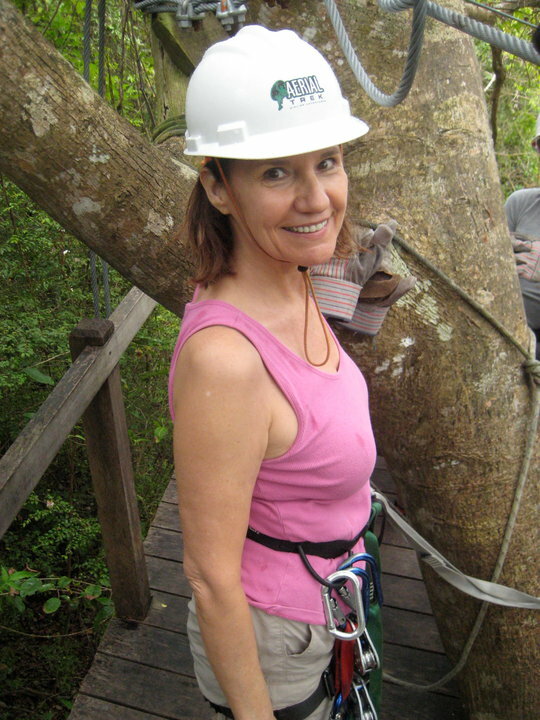 Amusement park rides, steep mountain trails, even ladders—all sent me into a panic. Flying on commercial planes was fine, but the nausea and shakes I had during an afternoon in a small plane left me swearing that I’d never get in one again. 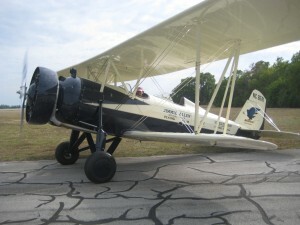 Which is exactly why I jumped at the chance to take a flying lesson in a small, open cockpit 1929 vintage biplane recently. Because I’ve been on a mission to overcome my fear of heights. It’s part of a larger goal to deal with all of my irrational fears. One of the things I’ve learned about fear in the last few years is that it can be provoked by real or imagined danger. And like many people, I have a wonderful imagination when it comes to scaring myself silly. But when imagined fears are in charge, our lives stay small and pallid. We avoid adventures large and small and retreat from opening our hearts to love, speaking our truth, and going for our dreams. Fear overtakes common sense, and even worse, it drowns out desire and passion. Yes, fear drowns out our desires and passions–those delicious yearnings and stirrings inside us that pull on us and guide us towards lives of pleasure, passion, and deep connection. In short, we can imagine ourselves out of the very adventure of being alive. I examined my thinking. I identified the thoughts fueling my fears and gently questioned them, looking for the truth. Is it true I’m going to fall, get stuck, trip, loose my footing, crash, die? What would this experience be like without the belief that I’m going to get hurt or die? Can I think of instances where I or others did these things safely? I worked through my scary stories just like that, one by one. The truth was always safer and kinder than my imagination was. I gradually challenged myself in the real world. I did this in ways that were fun and engaging. I put no pressure on myself. I did it because I wanted to, not because there was a voice in my head scolding or berating me. 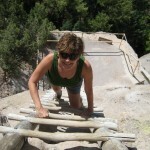 A couple of summers ago, I climbed 140 feet up a series of four ladders to Alcove House, an archeological site of the Ancestral Pueblo people in New Mexico’s Bandelier National Monument. I had to consciously breathe the whole way, but I did it. 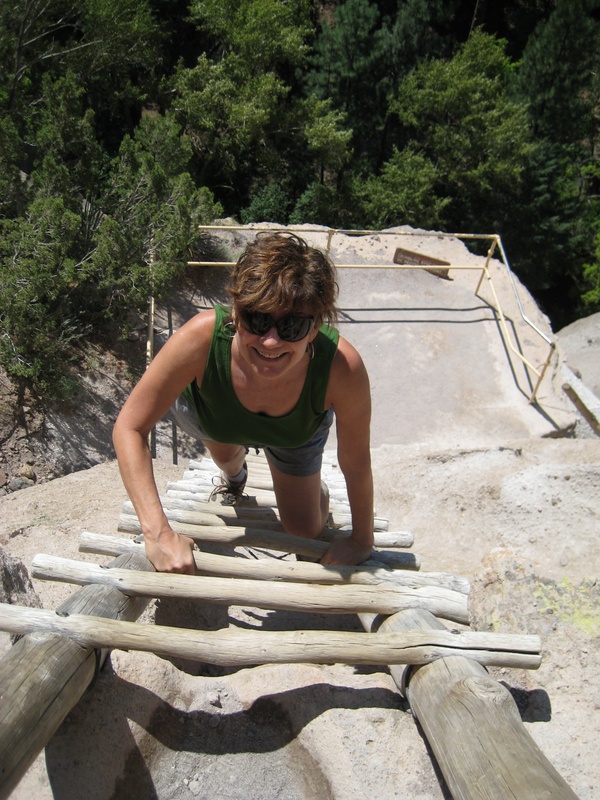 And I was also so elated that when I got back down to the canyon floor, I climbed right back to the top again. Guess what? The second time was a snap! 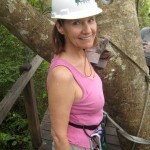 I went ziplining in the rain forest in Barbados, attached by a harness to a thin cable hundreds of feet above the ground. I coached and calmed myself, and before you know it, I was standing on a platform in the jungle, all hooked up and ready to soar. Lifting my feet off the first platform took some “feel the fear and do it anyway” self-coaching. But by the time I arrived at the end of the course, I was elated–no shakes at all! It was fun flying through the air! 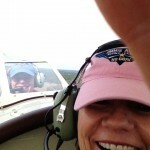 And then, a few weeks ago, I was invited to the grandest adventure yet—a chance to fly a very special small airplane. The very idea triggered the same old responses–sweaty palms, fearful thoughts, racing heart and legs like jelly. Several friends gave me “you’d better be careful” and “I would never do that” messages. My very vivid imagination got carried away more than once. And I climbed into the front seat of Buddy, a 1929 vintage Stearman Model 4 open-cockpit bi-wing airplane, one of only seven still existing in the world. I was a little afraid as I was getting settled into the leather cockpit seat when the shoulder straps repeatedly slid off my shoulders. Can I fall out if we tip over too far? But I realized that was just a predictable little protest from my lizard brain, and immediately diverted myself with some gentle breathing . And once we began taxiing, fascination and excitement took over. My fabulous instructor, Sarah Wilson, sat in a compartment just behind me; we wore headsets and talked to each other the entire trip. 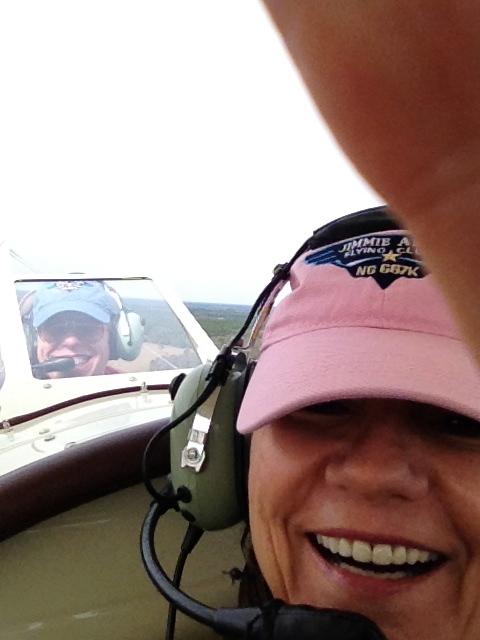 She gave me clear concise instructions, and before long, I was steering the plane, guiding it up and down, left and right, and even into a figure “8.” Sarah’s ebullient energy and deep love of what she does encouraged me to engage and have fun, and made the day even more special. We flew high and we flew so low we could smell the orange groves beneath us. 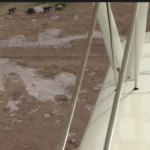 We saw elephants in a field at the Ringling Circus Center for Elephant Conservation. 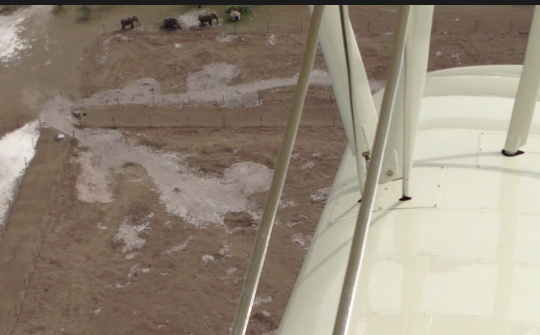 We saw cows and flocks of birds and highways and farms. And when we landed, I realized that I hadn’t had one single frightening thought, my heart never raced, and I didn’t have to remember to consciously breathe. I had so much fun and it was so interesting that I forgot to be afraid. Will my irrational fears return? Who knows? It doesn’t matter. If they do, I’ll just keep chipping away at them. But this I do know: when we intelligently and consistently confront the things that hold us back from our dreams, we find the places where we come fully alive and where we soar. And in that place, the sky is the limit.